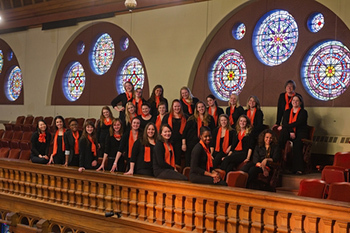 The Syracuse University Women’s Choir will present “The Story Behind the Song,” its final concert of the year, on Thursday, April 24, at 8 p.m. in the Rose and Jules R. Setnor Auditorium, Crouse College. The concert is free and open to the public. Free and accessible parking is available in the Q-1 lot; additional parking is available in the Irving Garage. Campus parking availability is subject to change; call 315-443-2191 for current information. The choir performs under the direction of Barbara M. Tagg, faculty member in the College of Visual and Performing Arts’ Rose, Jules R. and Stanford S. Setnor School of Music. The concert will begin with the choir singing Chesnokov’s “Svéte Tíhiy” (“Gladsome Light”) from the balconies of the historic auditorium. The choir will move to the stage for Veljo Tormis’ “Lauliku lapsepõli” and Otmár Mácha’s “Hoj, Hura, Hoj” (“O Mountain, O”). Each selection has a unique story. The background story may tell for whom the song was written, why the composer wrote the song, where it was written or its historical context. The repertoire includes a centuries-old melody, folk melodies, historic work and songs that inspire. The SU Women’s Choir is a non-auditioned choral ensemble that includes graduate and undergraduate students who are music and non-music majors from throughout the campus. The singers represent nine states and 27 different majors on campus and come from nine countries. For more information, contact Tagg at 315-443-5750 or btagg@syr.edu.